Spotlight on Contractors: Baker Electric Loves L.A. Celebrating their 80th year in business in 2018, Baker Electric toasted to their longevity by expanding the four generation, family-owned company based in San Diego to the City of Los Angeles. Since 1938, Baker has delivered electrical contracting services to the greater Southern California area with uncompromising quality, innovation and integrity. The exponential growth in the number of projects in the region over the past few years has led Baker to open a new office in Los Angeles to better serve the greater L.A. County market. “We are very excited to establish a significant position within the L.A. market by the end of 2019 positioning Baker Electric as a committed partner to this region.” said Baker Electric owner Ted Baker. Today, in addition to the hundreds of field employees in and around San Diego, Baker ‘s field electrician workforce is rapidly growing in the Los Angeles area. “As a committed partner to the region, Baker is ready to take on the challenges in this diverse market.” said Allen McLane the Director of Baker Electric’s Los Angeles office. Allen continued by saying, “We have the support from our owner Ted Baker and our talented team is ready to make a real contribution to the Los Angeles electrical contracting landscape”. Baker Electric’s robust array of services has allowed them to develop a diverse portfolio of commercial projects in Construction, Renewables, Tenant Improvement, Systems Infrastructure and Services & Special Projects. Baker’s ability to rely on their experience and expertise in completing state-of-the-industry projects ranging from large-scale solar systems to EV charging stations for numerous different verticals has set them apart from the pack. What is the Baker difference? It’s simple. As is expected from a company with 80 years of excellence under its belt, Baker recognizes the importance of investing in its people. From the field electricians to the administrative support team, it’s the people that come first. Even the company motto, “We deliver energy through people”, reflects Baker’s understanding of the fact that any successful company that prides itself on excellence is simply a sum of its parts. “Teams that take pride in their work, take pride in the company they work for and in the service they provide to their clients.” Allen said. An IBEW union contractor since the company’s inception and a member of NECA since 1957, Baker understands the importance of putting its employees first. Generations of Baker electricians and their families have benefitted from the most competitive wages, health care and other invaluable benefits afforded to them such as employer-provided pension plans. Baker’s ability to deliver on its commitment to an employee-first business culture year after year is a key differentiator in the industry. The future indeed looks bright in California. 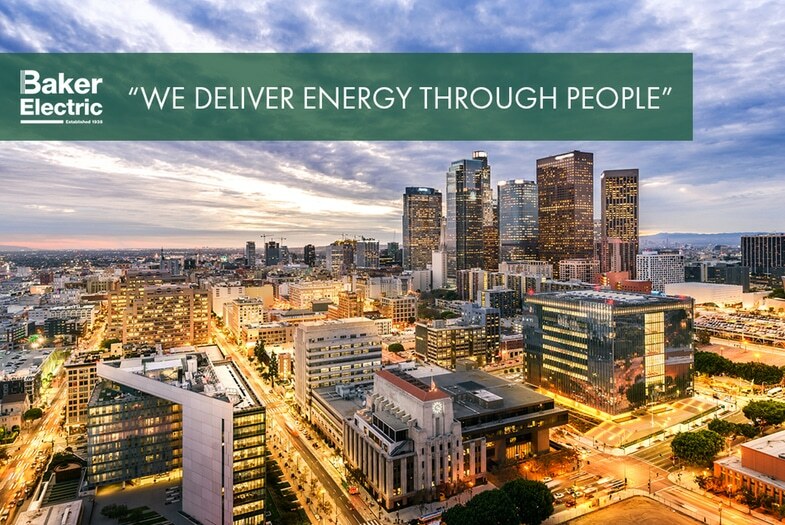 With new opportunities popping up every day in this scaling economy, Baker Electric is excited to play a major role in the historic growth of Los Angeles. Building on 80 years of excellence, Baker is primed to fulfill the demands of the current construction boom and beyond.